Few deep-seated instincts are stronger than parents‘ desire to provide healthy food for their children. It’s an emotional issue . . . and a confusing one for many new moms and dads. Organic from the start. 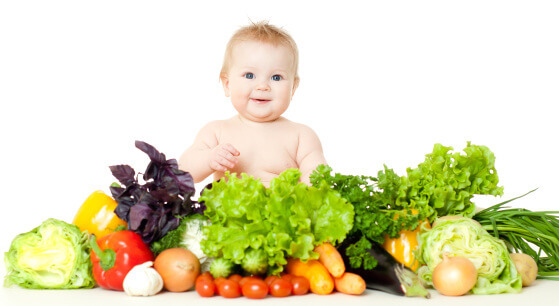 I tell parents it’s important to give their child the healthiest foods possible right from the start. Kids need a wider margin of safety. Because young children are more vulnerable to developmental damage from pesticide residues on foods, widening the margin of safety for them is appropriate. Most tests done by the Environmental Protection Agency (EPA) to set acceptable risk levels for pesticide residues were conducted using 154-pound adult men, not 40-pound preschoolers! In 1993, a congressionally mandated study by the National Academy of Sciences expressed concern that existing methods of risk evaluation for pesticide exposure were failing children. More recently, the Consumers Union and the Environmental Working Group released studies confirming that children are over-exposed even if their exposure is within legal limits. The Food Quality Protection Act of 1996 enacted many of the recommendations suggested by these studies. When there are inadequate data to assess developmental risks, the Act requires the EPA to use a 10-fold margin of safety to protect children when setting standards for pesticides on food. Thus, the situation is changing, but the process is slow, and encumbered in bureaucracy. Our kids are young now—we can’t wait. Has organic been proven safer? Some people challenge that organic foods have not been proved healthier than conventional ones. I believe exactly the opposite to be true. Organic farmers have grown safe, nutritious food for hundreds of years; conventional farming has been the norm for a small fraction of that time, and its safety is still in the experimental stage. Determining the safety of a conventional pesticide may take 30 years or more. We know now, for example, that some of the older pesticides, such as DDT, caused serious health problems in children. But this didn’t become evident until 30 years after the substance was banned for environmental reasons. We may not see the full effects of the new, subtler poisons we’re putting on crops for a long, long time. Eating organic can help. One of the ways I empower parents is to give them solid information they can use to make healthy choices for their children. A 2003 study conducted by the University of Washington tracked a group of preschool children—18 with organic diets and 21 with conventional diets—and analyzed their urine for evidence of exposure to five different kinds of toxic pesticides. Researchers found that the average total was six- to almost nine-times higher for children with conventional diets than for children with organic diets. They concluded that consuming organic fruits and vegetables can provide a relatively simple means for parents to reduce their children’s pesticide exposure. A 2006 study conducted at Emory University supported this conclusion. Researchers found that upon switching from a conventional to an organic diet, urinary levels of two organophosphate pesticide metabolites decreased immediately to an undetectable level. What’s the best way to start? If you can’t go all organic, try starting with foods that will have the greatest impact. The Environmental Working Group’s “A Shopper’s Guide to Pesticides in Produce” lists the least contaminated and most contaminated foods. This can be a useful guide in selecting the most important organic produce to purchase. But it’s even more important to purchase organic meat, dairy, and eggs than fruits and vegetables so if you must stretch your food budget, start with animal products. When you choose organic, you’re not only protecting your family’s health, you’re helping to protect the environment, too. The environment is our groundwater . . . it’s our world. Organic is healthy for farmers, healthy for plants, healthy for animals, and healthy for kids. It’s a legacy we can feel good about leaving to future generations.